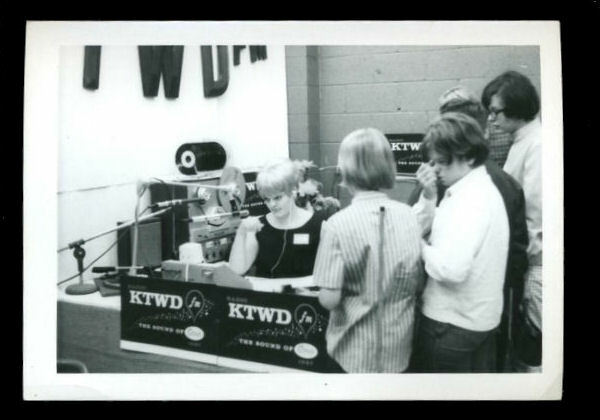 The following is Jaynie Dillon Jones's interesting account of how she came to work at KTWD-FM and what it was like working there. Jaynie has worked at several stations in Washington state and is currently living in the Puget Sound area. You can find her bio and other information about Jaynie at her website http://jayniejones.voice123.com On the website, she posted a 97-second demo recording of some scripts and commercials she has done. "I had worked for KCYS-FM, in Richland, for the better part of a year prior to heading off to seek fame and fortune in the big city of Spokane. I left my parents home with everything I owned in the trunk of my black '57 Plymouth Fury and a total of $17.00 to my name." "When I arrived in Spokane with no job and no place to live I went to the YWCA and was given the name of an 84-year-old woman, Pearl Mahn, who provided room and board for $5.00 a week. Fortunately for me, I was hired at KTWD before my $17.00 ran out. Starting pay was $1.65/hour." "The TWD in KTWD-FM's call letters stood for Terry William Denbrook. Terry's parents purchased the station for him. Terry was/is a brainiac in electronics and thus was the chief engineer and station manager; you'll find him today at KCTS-TV, Channel 9, in Seattle, as an engineer." "Wayne Henry Zemelka was on-air, program director, and sales manager; he went on to become a chiropractor and resides now in Davenport, Iowa. "John Sherman Kauz-Loric was an air talent; resides in Seattle now. "Gerry Giles had a 1st phone and was also on-air; for decades he has been an engineer at KREM-TV. "Paul Quam was another on-air personality and also worked at the Garland Theatre." "The radio station was located in a two-story building on Garland in the block just east of the milk bottle dairy store (The building featured a 20' or taller archictectural feature that was shaped to look like a glass milk bottle). [Editor note - The milk bottle building still stands and is considered a well-known Spokane landmark.] The radio station occupied the lower floor and our 100,000 watt FM transmitter sat just outside the door of the control room. Apartments were on the second floor of the building. Terry Denbrook lived in one them." "Our format was easy listening, adult, MOR. The format itself was extremely simple compared to today's ultra-scientific music rotation. We had four bins of LPs. Male Vocal, Female Vocal, Group Vocal, Instrumental. And that was also the format. Male Vocal, Female Vocal, Group Vocal, Instrumental. I did a show in the evening from 6 - Midnight and worked in the office during the day creating the program logs and handling traffic." "I started at KTWD-FM in the Spring of '68, married that fall, gave birth to my first child a year later and named her after the beautiful young woman who replaced me on-the-air. She was a model on billboards seen all around town. Her name was Evelyn Alice Anderson. I moved to Seattle in April of '70, so that was the end of my time at KTWD." "Something you might find amusing: When I was hired by KTWD-FM, in Spokane, it was primarily because they "just had to see this person" (that's what I was told) after they heard my audition tape. "I had recorded the tape at KCYS-FM, Richland, before heading off for the big-time in Spokane. Since I started my first radio job without having attended broadcasting school I only knew 'about' audition tapes, but I didn't really know what should be on one. I deducted that it should demonstrate one's best work. One thing I knew I was really good at was: Typing! So, I wheeled a manual typewriter into the studio and performed a 60-second timed typing test with the mic open and tape rolling, then I dutifully counted up how many words I had typed and how many errors there were in the 60-second timing. "The people at the station in Spokane were regaled with laughter when they heard the tape. They couldn't believe it! They said, "We've GOT TO see this person!!!" Thus, I was called for an interview and was hired. Somewhere I still have that original tape, on a tiny little 3" reel here in the storage area of our basement. Terry Denbrook, Wayne Henry, Gerry Giles, and John Sherman Kauz-Loric had all been absolutely convulsed with laughter about my 'audition.' But hey, I GOT the job!!!" 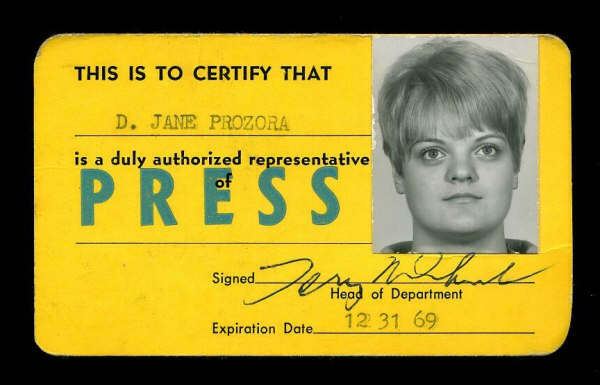 For Jaynie's account of what it was like to be a female on-the-air personality in the 1960's and 1970's click here. Jones, Jayne Dillon. Email correspondence to Bill Harms. 7 August 2007.